I’ve moved the link for the MSU Horticulture Garden News from MCMGA links into Garden Resources you will find it there. I’ve also add two added resource links in the Gardening Resources. These were provided by Frank and Jennie. The first is The Oakland Gardener Newsletter. This newsletter gives us incite and ideas of other projects going on. The second is Agricultural Research Services. Jennie commented “this site offers research reports as well as a section for kids with ideas for ag-related science fair projects, and simpler descriptions of some of the interesting research like feeding citrus peels to cattle so that the natural antibiotics can regulate harmful bacteria in their guts. And there is the 2012 hardiness zone map. Looking at the Michigan section, I see the Milan and Dundee folks are still 5b, while you LaSalle and Luna Pier gardeners can try “southern” 6b plants!” I’m sure you will find both of these sites great reading resources. Who can think of the month of February without thinking of a Rose? The rose is of the genus Rosa and is a woody perennial. It belongs to the family Rosaceae. Although we associate getting roses from our loved one with the hybrid tea rose, my favorite to grow is a “true knockout”. The Knock Out® Rose is the most carefree rose you can grow. It’s winter hardy as well as heat tolerant. It’s even self-cleaning, although you may want to deadhead it after bloom to encourage additions flowers. This rose is also the most disease resistant making it a great choice for the garden. You can find it blooming every 5-6 weeks until there is a hard frost. Knock Out® roses come available in a variety of colors with single or double blooms. To top all of these positive growth habits, you also find them available fragrant. To add one more benefit of this plant; its foliage is a health lush green that looks good even when the plant is not producing blooms. What more could a gardener ask for in a rose? Just sit back and enjoy it’s beauty. Plant it for a shrub border, a hedge or for a foundation planting. I’ve even added them into containers. It’s a great stand alone rose, but accents other plants perfectly. We are all aware of how much we have to maintain the typical hybrid tea by pruning, making sure it doesn’t have black spot or even downy mildew and getting that one or two few blooming times a season. This rose gives us beauty throughout the season. Plant one this spring, if you haven’t already and enjoy. Send me your photos for Foto Friday of your favorite rose. You should now be able to view events on our Calendar Page. If you have an event you would like to have posted on the calendar, please send it to me by e-mail. You will see a new link added to our MCMGA links found along the right side of the Blog called MSU Horticulture Garden News. It is toward the bottom so scroll down to find our MCMGA link area and click on MSU Horticulture Garden News. The link will then load to that page. This is a great informational link with many articles for us to dig into during these winter months. Credit for giving us this source goes to Georgeann who sent it to Frank. I think you all will enjoy it. 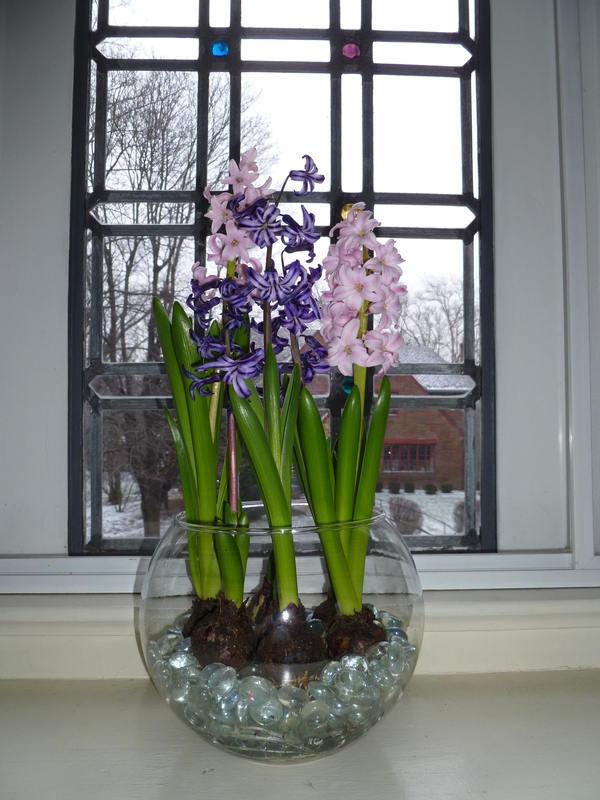 The forced hyacinth bulbs are blooming although it appears a few of them will not bloom. As expected, because these are second year bulbs, the blooms are small. But the fragrance of the blooms is still very heady, filling the room with the promise of Spring. When I try this project again, what would I do the same and what would I do differently? Photos taken April of 2007 when I purchased a 4 shelf, chrome stand and 3 2-lite shop lamps – with chains for hanging -from Lowes. The stands are sold unassembled and they are offered with either 3 or 4 adjustable shelves (but everything has to be removed from the stand to adjust the shelf height). 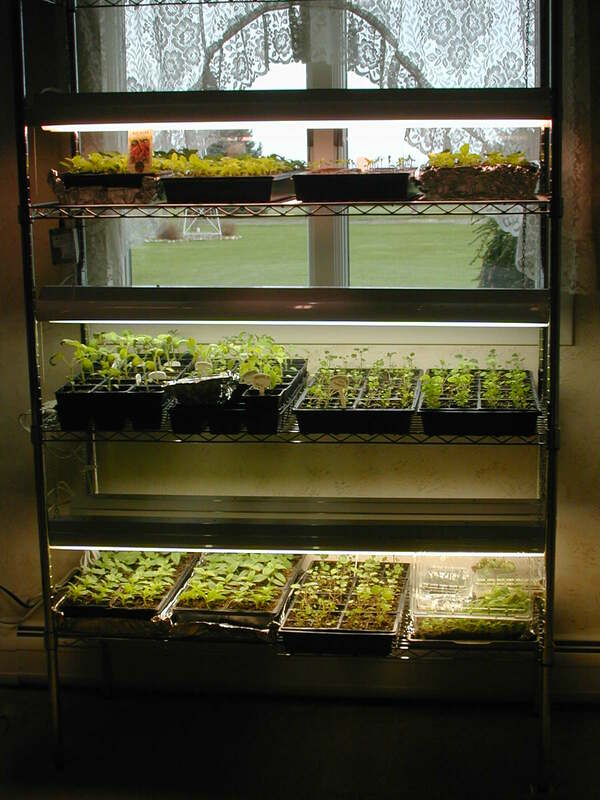 I found it much easier to evenly space the 4 shelves from top to bottom, hang the 3 shop lights and then stack books and/or boxes under the seedling trays so the plants are always very close to the lights but not in direct contact. Once the plant trays are in place it is too difficult to get to the chains to raise and lower the lights – much easier to raise and lower the seedling trays! As much as possible keep plants similar in height together. Google “growing plants under fluorescent lights” and you will find all the information you will need to be successful. If you have a south facing window that also works quite well. 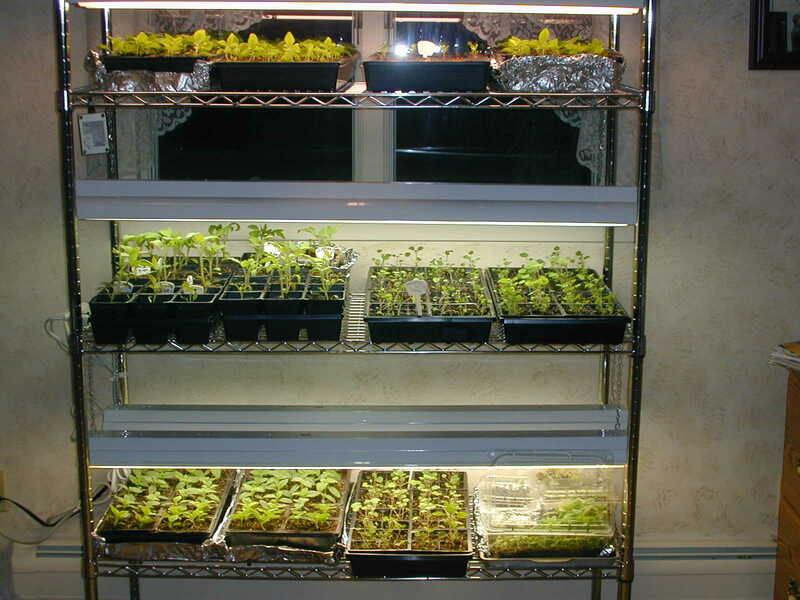 I have put seedling trays on TV trays in front of the window but they will grow toward the light and have to be turned several times each day. If the sun doesn’t shine for several days you will quickly end up with very weak, leggy plants. I took these pictures last spring when I was starting my pepper seeds. Today the snow is blowing outside and the new seed catalogs have been coming in the mail. It is time to start thinking about what seeds we want to order this year. I like to use the Jiffy peat pellets for starting pepper seeds. I grow many different varieties that I don’t want to mix up and I only want a few plants of each variety. Here are the peat pellets in containers. The ones in the back two black trays have had warm water poured in them and are beginning to swell up. The white pieces of plastic are going to be dividers to separate varieties. I don’t know if you can see it on here or not, but the black trays are labeled “A” “B” “C” “D” and I keep notes of what is planted in each tray. The clear ones on the left are just deli containers. They do need to have lids to keep the growing medium moist until the plants come up. The pellets are now fully swelled up and ready to plant. Pull the netting back some with a toothpick. Open a small hole in the peat with the toothpick. Planting depth about three times the size of the seed. Drop a seed in the hole and use the toothpick to cover the seed, pressing lightly for good seed to soil contact. Trays in a warm spot to germinate. (My kitchen floor next to the radiator) This was March 12. On March 18, the first of the seeds were up. March 18, putting up our temporary greenhouse on the door opening of my husbands heated barn. Starting March 22, the peppers spend days in the greenhouse in the sun and nights in on the barn floor with the door closed. April 4, here the peppers are on the heated floor of the barn, with the door open from the barn to the greenhouse. The largest ones have a second set of leaves and are ready to be transplanted into single squares. Although technically you can leave the netting around the pellet when you plant it in a larger container, I gently pull it off, so you want to do this before too many little roots have grown through it. Pepper plants on April 30th. Some have been in their single squares for over 3 weeks now. They are gradually getting used to outdoor conditions, either with the greenhouse doors open, or as here spending some time outside on the cart in direct sun. This year, they were planted in the garden the first week of May.